Burr's vivid depiction of Georgia. 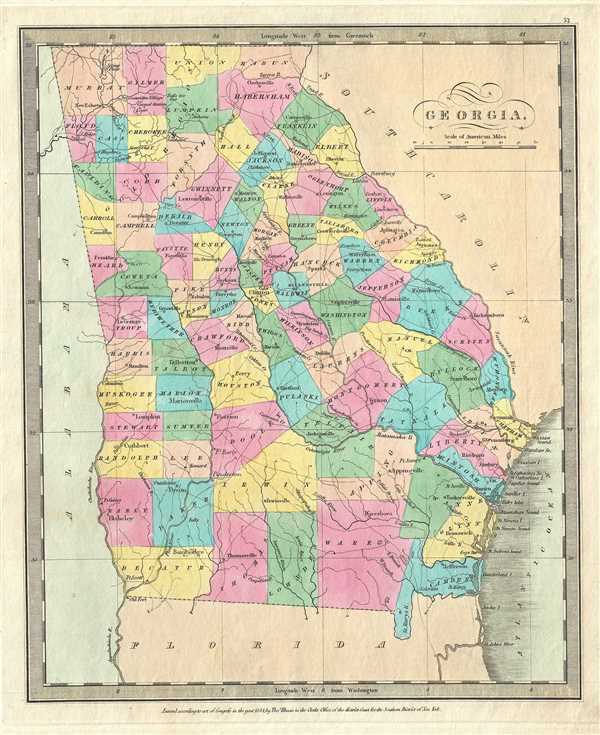 This first edition map of Georgia was issued by David S. Burr in 1834. It depicts the state in detail, noting roads, rivers, lakes and a host of other topographical features, with relief shown by hachure. Offers color-coding at the county level. According to Ristow, although Burr is credited on the title page, he left this atlas incomplete. He was appointed as topographer to the U.S. Post Office, and of the sixty-three maps finally included in this atlas, only completed eight. The rest of the maps were then completed by Illman and Pilbrow in Burr's style. This map was ‘Entered according to act of Congress in the year 1834 by Thomas Illman in the Clerk’s office of the District Court for the Southern District of New York’, but was not published until the atlas was released in 1835. Published by D. S. Stone in Burr’s New Universal Atlas. Burr, David H., A New Universal Atlas; Comprising Separate Maps of All the Principal Empires, Kingdoms & States Throughout the World: and forming a distinct Atlas of the United States, (New York: D. S. Stone) 1835 (First Edition). Burr's New Universal Atlas was first published in 1835. It is one of the first great American commercial atlases and one of the most important to appear before the Civil War. Burr was most likely initially inspired to publish a 'universal atlas' in pursuit a more general audience by the success of his 1829 Atlas of New York State. He began work on the Universal Atlas sometime around 1830. By 1832 he had copyrighted eight new maps for the work. Around this time he accepted a position as topographer and cartographer for the United States Postal Department and was thus unable to finish the atlas personally. Instead, while retaining editing rights and overall ownership, Burr passed much of the production work to his engravers Thomas Illman and Edward Pillbrow. The first edition of the atlas was completed in 1835 and published by D. S. Stone of New York. A second edition, published by William Hall, appeared in the following year, 1836. Both editions featured 63 maps, the first part of the book being dedicated to world maps and the second part to the Americas, particularly the United States. Some of 1836 editions features outline rather than the distinctive full color common in the first edition. The plates for the atlas were later sold to Jeremiah Greenleaf who expanded the atlas to 65 maps and issued editions in 1840, 1842, and 1848. Very good. Minor foxing. Original platemark visible. Rumsey 4628.052. Philips (Atlases) 771.